I love personal finance. Ever since my senior year of high school when I was introduced to economics, I’ve loved the world of finance. I even went to college for finance and worked in the financial services field for over 15 years. I love personal finance so much, I even read about it in my free time. Because I’ve read so many books on the topic, I decided to share with you my favorite personal finance books. 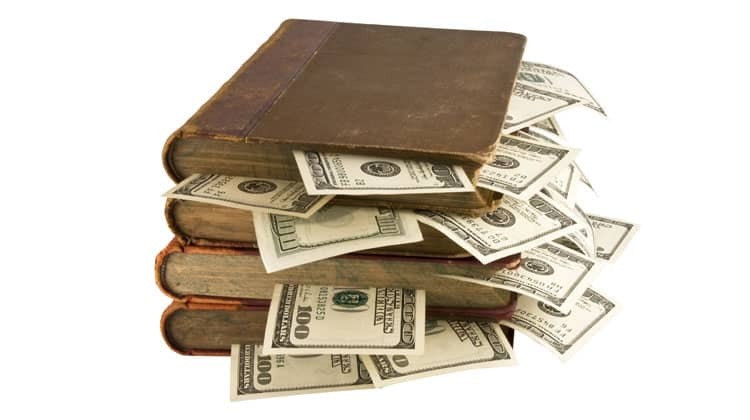 Below you will find the books I recommend as well as a short reason as to why I think the book is so powerful in helping you to improve your finances. Be sure to also check out my resources section. There you will find more great solutions to help you improve your finances and live a better life. So without any more waiting, let’s get to my list of the absolute best personal finance books! Your Money Or Your Life by Vicki Robin, Joe Dominguez and Monique Tilford, walks you through how to get out of debt, re-order your priorities, resolve conflicts between your values and your lifestyle and how to save the planet while doing so. This book is great and I still use many of the principles to this day. I particularly enjoyed the part about aligning your lifestyle with your values. I wasn’t too keen on the environmental part, but its message didn’t override the other great advice in the book. If you are going to start with any personal finance book, this one should be at the top of your list. You can click here to buy this book on Amazon. Live It Up Without Outliving Your Money by Paul Merriman outlines how you should invest your money to receive the greatest amount of return with the least amount of risk. This is a short, easy read. This is the best book about investing for beginners based on how simple it is to follow and even the model portfolios that you can build in real life. I read it in one night because I couldn’t put it down. One chapter builds upon the previous one as Merriman shows you how to build the ideal, low cost portfolio. The Millionaire Next Door by Thomas Stanley and William Danko describes the 7 traits that are most common among millionaires. The surprising thing is that many of the millionaires you would not suspect as being millionaires. This book really opened my eyes to the idea of perceived wealth versus actual wealth. It’s a must read for anyone looking to become wealthy one day. It helps to show you what true wealth really is. Think And Grow Rich by Napoleon Hill is a self-help book that doubles as a personal finance book. It was originally written in the 1930’s with the hope of helping people survive the Great Depression. The book is full of interviews the author complied on wealthy people during the time and the lessons learned. It is a timeless classic and most financial experts agree that this book is a must read. 7 Habits Of Highly Effective People by Stephen Covey is another self-help book. While this one doesn’t specifically talk about money, the 7 habits will help you to become the best person you can be. When you do this, it flows through to your finances and you will see your finances grow as a result. Please don’t be turned off by the fact the book is more self-help than personal finance. When I was at a low point in life, I read this book and it changed my life and my finances for the better. It really is a powerful read. 7 Investing Steps That Will Make You Wealthy by Jon Dulin is an excellent book for investors. When I wrote this, I wanted to help the many people struggling to make money in the stock market. Since I have been able to grow my wealth to over 7 figures thanks to investing in the stock market, I decided to write a book and share the strategies I have used to make money and grow my wealth. If you follow these steps, I am certain you too will make money investing in the stock market. The Richest Man In Babylon by George Clason is written in the image of Aesop’s fables. It centers on a man in Babylon and how he learned to manage his money. It contains 7 lessons that are powerful and will improve your finances the moment you begin to follow them. Along with the 7 Habits of Highly Effective People, this book has had a major impact on my financial life. The best way to improve your finances is to learn more about the topic. My favorite way to do this is to read about successes and failures from others and take those lessons and apply them to my personal life. Not all the time am I able to use the information I learned for my benefit, but there have been numerous times I was able to. In doing so, I’ve see dramatic improvements not only in my finances, but in my overall life as well. So I encourage you to check some of these personal finance books out and start working on improving your financial situation. You can do it, you just need to take that first step. Yeah, there are a lot of unknown millionaires because they still live just like any of us would do.. Thanks for the links. I always love good book recommendations. Will be checking these out, thanks so much for sharing!